It doesn’t matter which corner of the world you are looking, noodles are everywhere. They are a staple of global cuisine. Next time you’re craving some, look no further than the eclectic restaurants of Kansas. From ramen to fried options, here are the best places to enjoy a bowl of noodles in the state. Sichuan Dynasty in Overland Park has been named as one of KCUR 89.3’s favorite noodle spots, specifically citing the Dan Dan noodles. This authentic Chinese restaurant has several other noodle dishes on the menu, including the Sichuan cold noodles and Noodles with pork and pickles mustard tuber. For a truly unique treat, head to Yokohama Ramen Joint in Wichita for a delicious spin on this traditional Japanese dish. Choose from shoyu ramen, tonkotsu ramen, chicken paitan ramen, and a variety of amazing vegetarian options, too! Blue Koi serves Chinese starters, noodles, and rice dishes from their Leawood, Kansas location and another one on the Missouri side of the Kansas border. They’ve got fourteen different noodle dishes on the menu, but the Ants on a Tree, served with sautéed minced pork or vegan-mix bean noodle, is one of our favorites. Bo Lings has three locations in Kansas proper with another three in the Missouri side of the Kansas/Missouri border, including two in Overland Park and another in Lenexa. Bo Ling’s menu is extensive with an entire section dedicated to Chinese-inspired noodles. The Bo Lings’ Fried Noodle is particularly good. Vietnam Café is a Kansas City spot “serving rice platters, curry, pho, stir-fried noodles, and more,” according to their website. Their pho comes in eleven options, including a “super-sized bowl” with rice noodles, choice of protein, beef broth, bean sprouts, lime wedge, and jalapeno pepper. Ramen Bowls brings signature soups, noodle dishes, and small plates to Lawrence, Kansas. They offer take-out and delivery in addition to sit-down service and $2 off each ramen bowl for lunchtime meals. Noodle addicts must try the Pad Thai ramen, wonton noodle bowl, and gyoza ramen. Sakura Japanese Cuisine in Wichita, Kansas serves all kinds of delicious Japanese foods including sushi and fried rice, but their noodle dishes are of particular note. Try any of their twelve ramen dishes for an authentic taste of Japan in Kansas. 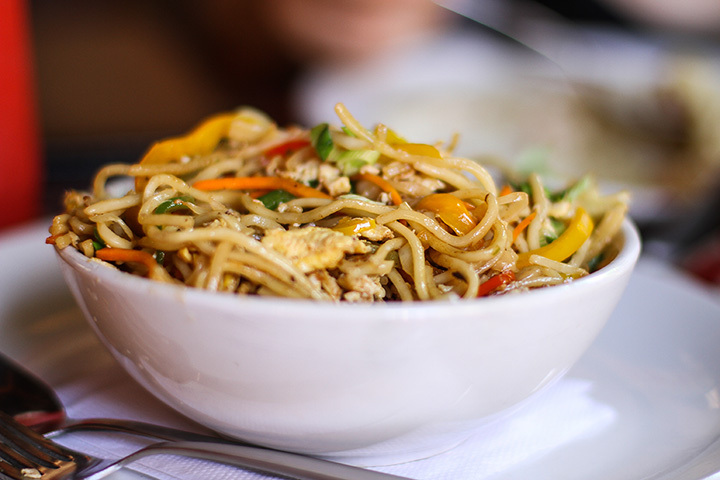 HuHot Mongolian Grill offers lunch and dinner service. They are a growing chain with locations across 18 states, including locations in Lawrence, Manhattan, Shawnee, Topeka, and Wichita. Fill your bowl up with as many noodles, veggies, and proteins you’d like and let the chefs cook your dish right in front of you.